This publication also covers the issues involved in installing the cooker in the wall of a building. It does not provide detailed construction plans either for the cooker or its installation. This leaves wide latitude for selection of materials that are locally available and/or compatible with the type of home construction. Throughout we assume a northern hemisphere location. Down Under readers will be obliged to substitute “north” wherever “south” is encountered. Solar Wall Ovens are available from the Kerr-Cole Center as completed units. Contact us at for kerrcole@frontiernet.net for price and delivery. The Solar Wall Oven also works very well as a freestanding cooker that can be transported from site to site. When freestanding it can be aimed to keep it pointed in the direction of the sun, which lengthens the number of hours it can cook each day. When freestanding, this cooker gives excellent results both in temperate and equatorial latitudes. However it is used, the rear-opening door of this design is a major convenience compared to conventional top-opening cookers. We drill a hole in the bottom center of the cooker that can mate with a small rod projecting from the top center of a 55-gallon drum. The oven is placed atop the drum such that it pivots on the rod. It helps to soap the drum rim so that the cooker rotates easily. The drum is half filled with water to keep the whole works from blowing over. In temperate latitudes the cooker may be used freestanding during construction and then attached when the house is ready. Or, for maximum convenience, one may wish have available for use both a freestanding and an attached cooker. Slant-faced, reflectorless, cookers mounted in a wall are suitable for temperate latitudes only. In tropical regions, the sun will be on opposite sides of the home summer and winter, progressively restricting the seasons of usefulness of a fixed mounted cooker the closer to the equator it is installed. In northern temperate regions, the structure must have a south-facing wall available for installing the cooker. True due south orientation is preferred for the cooker. A wall-mounted cooker cannot be turned to follow the sun. A cooker aimed SE or SW will limit afternoon or forenoon cooking respectively. A true south cooker (without reflectors) will be effective from about 9 AM to 3 PM solar time from mid February to the beginning of November (northern hemisphere). It will still work for more easily cooked foods for the balance of the year from about 10 AM to 2 PM. The wall must be relatively free of shading by nearby structures, geological features and trees for a large percentage of the day throughout the seasons. The roof overhang may partially shade the cooker in some seasons, hindering cooking, particularly in the latitudes nearer the tropics. A detailed treatment of this topic is given in Section 11. The cooker is best suited for homes designed with solar cooking in mind. It will work in existing homes only if a suitable south wall location is available. 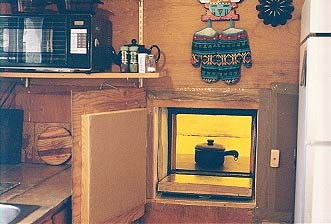 Installation through a window might be a practical and simple way to retrofit a Solar Wall Oven. Although we have not tried this ourselves, it seems that if it were placed freestanding on a shelf outside the window, it could be aimed from inside to follow the sun. Optional auxiliary reflectors might be managed by reaching out the window, and the cooker might be slid in and out for loading and unloading. If glazed with lightweight plastic rather than glass, the cooker might even be moved during the day to take advantage of which window is getting the sunlight. The geographical restriction to the temperate zone installation would be much less of a consideration for dome shaped structures, or vault shaped structures with the long axis oriented east-west, than it is for vertical walled structures. There will be a much lower tendency for the building to shade the glazing when the sun passes on the “wrong side” of the house in the summer. In the tropics one should choose the south side if located north of the equator and the north side if located south of the equator. The glazing angle should be flatter than the 20 to 30 degrees suggested for the higher latitudes, as the sun will be generally high in the sky all year. Indeed, at the equator, horizontal glazing would be best, and one may chose to install the cooker on either the north or south side with equal justification. 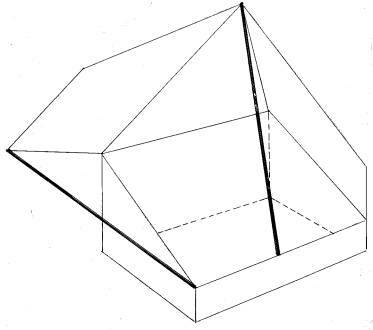 For a dome near the equator, any orientation will suffice, even due east or due west – as these orientations would sacrifice heat collection due to shading by the house only when the sun is near the horizon on the opposite side of the house. Building a durable, effective, slant-faced, through-the-wall, box cooker to attach to a house is not as easy or as inexpensive as one might suppose. There are problems with angled construction, providing a door, proper sealing and obtaining proper materials – particularly the glazing. The materials inside and outside the oven variously must withstand for the life of the cooker (potentially 50 years): 350 deg F, high humidity, UV radiation, freezing, impact, sandstorms (Arizona), moisture infiltration, abrasion by cooking vessels and food spillage while achieving good cooking capability, attractive appearance, food safety, easy maintenance and cleanablity. For example, while there exist many inexpensive choices for insulating material, these generally come at the cost of complex construction to contain them, protect them, and keep them dry. Another example: although strong, available, easy to fabricate into the desired pieces for construction and easily fastened together, wood will not withstand intense solar radiation on hot exposed surfaces, such as the rim of the cooker where the glazing is attached. Left continuously exposed to the weather, it shrinks, warps and splits. It requires yearly repainting with marine varnish to prevent degradation. As for glazing, you get a choice of cheap and not durable plastic; high-grade, high temperature solar plastic (difficult to find or downright unobtainable); or tempered glass (good looking and very durable but expensive and heavy). Figure it may take a week of full days (assuming you do not have access to a well equipped wood and/or metal shop), plus $150 and up in materials, to build a glass glazed, plywood box cooker. Note that Barbara’s present Solar Wall Oven, built with a plywood exterior, crushed newspaper insulation, aluminum foil covered corrugated cardboard inner walls and tempered glass glazing - put together with lots of silicone sealant - has remained in daily use for many years. The outside does require repainting and re-caulking occasionally. Freestanding Patio Oven cookers, built with these same materials, have remained in continuous use for 25 years. They are still in good condition. Ours has remained outdoors for this long, summer and winter in our desert climate, without ill effect. Builders constructing homes of insulating alternative materials such as papercrete, strawbale, rastra block and the like should consider incorporating wall ovens made of the same materials as an integral component of the structure. This would simplify construction, lower costs, allow for structural integrity and good environmental sealing, and make it possible to aesthetically sculpt the cooker to blend in with the exterior architecture. Be advised that this approach is conjectural. To date we have no reports of cookers made this way – and there are concerns that the higher thermal mass of these materials may impede cooking to a significant degree. Therefore use of these materials would have to be considered experimental until proven in practice. Our Center plans to evaluate these materials soon. Contact us and we will share what we have found out. The door generally will be the biggest problem in construction. Beware of metal doorframes or a metal rim on the door itself. Even thin metal foil will rob a surprising amount of heat by conduction from inside to outside. Gaps around the door allow air infiltration and therefore can cause heat loss. In calm air the loss is surprisingly small even for a poorly fitting door. For a through-the-wall installation with an otherwise tight oven construction, a loosely fit door, say with 1/16 inch gaps all around will loose little heat. But outdoors on a windy day the losses for a freestanding oven can be significant indeed, leading to concern for achieving a tightly fitting door for this use. Since the door is in the rear of the solar wall oven, it is not subject to intense solar radiation, even in freestanding use, making the use of wood feasible. However wood door parts expand when wet from cooking vapors; the door will stick unless constructed loosely. A tapered jamb “plug” door helps, but does not solve the problem of achieving a tight fit while avoiding sticking. We have had reasonable luck using a wood framed tapered door with a formed-in-place silicone gasket incorporated in the doorjamb. The silicone is plastered around the loosely fitting jamb and covered with waxed paper. Then the door is closed while the silicone is uncured, forcing it to conform to the door. The results are not necessarily pretty, and it will take days before the silicone has cured enough to open the door without tearing the gasket, but it does work. A commercial silicone high temperature gasket would quite likely give more professional looking results. The door (as well as the rest of the interior of the cooker) must be made of non-toxic materials that do not out-gas when hot. In freestanding use the door must be quite durable. People will tend to lift the cooker using the door handle as a grip. Worse, the door will be subject to very heavy stress if it is allowed to flop down with the rear of the cooker near the edge of a table, as a severe lever action will occur. Rigid metal hinges usually result in alignment and/or attachment problems. The writer prefers to hinge the door with cloth, such as cut from an old polyester pant leg, impregnated with silicone. Two layers are used, one on the inside and one on the outside of the hinge line so that the material resists peeling in either direction. This is not the best looking solution, but it certainly works well in practice. Another hinge material that works well is 1-inch web strapping. Three strips will suffice. Install ¼ -inch grommets in the strap at attachment points, then install using pop rivets or screws as appropriate. Venting: When an oven is tightly constructed all over, another problem often surfaces. Moisture from the food condenses on the undersurface of the glazing, blocking sunlight from entering the cooker and reducing the cooking capacity. One way to handle this problem is to provide two holes through the door about 3/4 inch in diameter. One may use 3/4 inch plastic hot water pipe to line the holes. One hole should be down low. The other should be up high. The upper hole should be closable to prevent unnecessary air circulation when the oven is dry (a plug of cloth or cotton would do it). The lower hole may be left open unless there are rodent and insect concerns. Another design uses a single slat pivoted at a point half way between holes placed one above the other at the top and bottom of the door. Rotating the slat opens both holes variably to the same degree simultaneously. Yet another method employs a Velcro hole cover movable to control the degree of venting. One normally keeps the vents closed, opening them only to the degree needed to keep the oven from steaming up. Door width: The wider the better. We suggest 26.5 inches to clear a full-size 26 by 18 inch baker’s tray slid in sideways. A tray this size allows cookware placed on it to be moved in and out en masse. With a door this wide, the upper doorjamb must be configured to carry a major portion of the structural load across the back of the cooker. A 26.5-inch door will open into the space between three studs on 16-inch centers by cutting out the center vertical stud. This produces an opening 30.5 inches in width, providing enough room at either side (a couple of inches) for external door flanges and for the construction of the pass-through tunnel walls. This width is our preference, although narrower doors have been used and may be preferable on some houses, depending on construction details and the layout of the kitchen. The door usually is configured to open downward or to the side. The down opening door is perhaps best, particularly if it is hinged at the bottom rear exterior corner of the cooker so that the inside surface of the door in the open position lies exactly at the level of the oven floor. This facilitates sliding cookware in and out over the open door, easily and without spillage. The upper surface should be covered with sheet metal (black or shiny) to combat abrasion and wear. Hard anodized aluminum is OK, but it will scratch. Polished stainless steel will be more durable. An upward opening door tends to be awkward and inconvenient unless some means is provided to hold it in the open position when cookware is being put or removed from the oven. For a through-the-wall installation with an upward opening door, a counterweighted cable or cord running from the bottom edge of the door exterior, up over the top of the cooker and down in front of the cooker does the trick, as the door will remain in place when moved either to the open or closed position. The door probably will need some sort of latch or catch to hold it completely closed, particularly for an outdoor cooker. It should be operable one handed so the cook can open or close the door quickly and surely with a pot in the other hand. A Velcro strip attached to the top of the door makes a good latch for a freestanding cooker if configured as a strap handle to peel open. The free end of the strap should wrap over the top of the cooker a short distance for secure fastening. The strap does not impede the full opening of the door to lie flat and level. Since the outdoor cooker will have the rear of the cooker exposed to sunlight, the Velcro will require occasional replacement. For better durability, check out your local garden supply merchant for the sun resistant Velcro straps used for tying up plants. For through-the-wall mounted cookers, a short, pivoted slat of wood installed on the top center of the oven doorframe has been found to be quite practical as a latch. Allow no thermally conductive sheet metal or metal foil paths from interior metal surfaces to exterior metal surfaces anywhere, such as around the top where the glazing meets the rim. The heat loss via such a path can be significant. The walls, door and floor should employ at least R-8 insulation, or close to it - the higher, the better. For most materials 2 inches thick insulation will be sufficient. Often 4 inches will give somewhat better performance, but heat loss through the walls is not of over riding concern. A high-performance insulation such as Dow Thermax polyisocyanurate foam board (the stuff with metal foil on both sides) requires only one inch. Do not use the commonly available Dow Tuff-R polyisocyanurate foam board (the stuff with black plastic on one side). It will not take the heat due to lack of fiber reinforcement. Be careful, some stores incorrectly call this stuff “Thermax”. It is not Thermax. A less appreciated consideration is the thermal mass of the interior walls that covers the insulation. Use very lightweight materials. It has been determined that, in real world cooking situations, a 1/8 inch thick Masonite hardboard oven liner soaked up 20 % of the available heat compared to the 10 % passed by the 4 inches of rice hulls it contained.1 All of this heat loss becomes unavailable for heating food. Use low thermal mass interior materials. Blackened or shiny thin gauge sheet metal, black painted corrugated cardboard and corrugated cardboard with a glued-on facing of aluminum foil (shinier side out) all give excellent results. The foil-faced cardboard can last 10 years or more before requiring re-surfacing. For lining the inside of the oven, the polyester coated “Aluminum Trim Coil” sold in roll form by hardware stores works well installed with the dark side showing (not the white reverse side). Some stores carry only a soft 12 mil type, chocolate brown on one side. Others carry a tougher 19 or 20 mil type that is sold only in 24 inch by 50 foot rolls. It comes in several colors; choose the dark brown if you cannot get black. The brown works nearly as well, but is not optimum. The SOS Sport cooker (www.solarovens.org) uses a black polyester finish, 20-mil aluminum as the liner because the heavier gauge and stronger alloy holds shape better. The 20-mil aluminum is stiff enough structurally to form the inner wall of the cooker without warping. Another liner choice is the less expensive, shiny, 12 mil “Aluminum Roof Flashing”, which is quite soft. The surface of this material is not of the highest reflectivity, but it does work pretty well. It might work a little better if painted black. Do not use polystyrene (Styrofoam) or polyurethane foam board. Heat will melt or seriously degrade these materials. One-inch thick Dow Thermax fiber reinforced polyisocyanurate foam board is an excellent insulator for solar ovens, but it is not commonly stocked and may be difficult to obtain in less than semi truckload lots. A roofer’s knife is OK for rough cuts if the foam board is going to be used as infill for cavities. However, if you plan to use the foam board structurally and need to make precision cuts you will find a knife does not “cut it”. Do not use a table saw or skill saw. If the dust does not get you first, it will clog and burn out the saw motor. We use a 5-inch diameter pizza cutter from a restaurant supply house (special order). Even larger is better – use a 6 or 7 inch garment cutting wheel if you can find one. Run the blade along the edge of an accurately cut 3/4-inch thick guide board to keep the cut straight and vertical. These blades have a flat and a beveled side. Depending on whether you are right handed or left handed, you may need to remove the blade and flip it over so that the flat side runs against the board, as this yields a more accurate cut. The more commonly available 4-inch pizza cutter is OK if you are not using a guide board, but with the board, the hub will bind against the wood. For angled edges, rip cut a guide board in a table saw to the desired slant. The writer prefers to make the awkward initial cuts on a 4 x 8 foot sheet on the floor with a sheet of plywood atop the foam so he can kneel on it without crushing it as he runs the cutter along the guide board. Cut with a board or piece of sacrificial carpet positioned under the foam so that the bottom of the blade rides on it. This protects both the blade and the floor beneath. It helps if the foam is raised about an eighth of an inch above the board using a sheet of cardboard so that the blade cuts through the foil on the bottom side of the foam. The dust produced in cutting Thermax has fiberglass particles in it. Do not rub eyes. Use a breathing mask. Wear gloves to protect against foil cuts and glass penetration into the skin. Vacuum the work area when done. A cruder and less accurate method of shaping foam board is to cut the pieces slightly oversize with a knife, then carefully rasp to the correct dimensions and angles. This produces loads of noxious dust, however, so perhaps doing this indoors is not a good idea. Outdoors on a windy day would be a better idea. Thermax, being a closed-cell foam, works when wetted. It absorbs very little moisture, and only on the edges where it is unprotected by the foil facing. This is a major reason why the Solar Oven Society uses it in the manufacture of their Sport cooker. See www.solarovens.org. If you are not using Thermax, keep the insulation dry. Most types are rendered ineffective when wet. Some types will compress and not recover shape when dried (notably fiberglass batt insulation). This causes poorly insulated voids hidden from sight that can cause poor cooking performance to develop for an oven that previously was working just fine. Water vapor from cooking food does condense in the insulation if the oven cavity is not sealed. In Arizona we have never had a problem with this due to the low humidity and tightly sealed construction of our ovens. In Minnesota, which has humid summers, crushed newspaper insulation in an unsealed cooker settled into a pile of paper mush in a single season. Thermax is rated for temperatures up to 300 F. There is a concern that cookers with external reflectors will get hotter than that this and may degrade the foam insulation. An excellent candidate for insulation that will take the heat is polyester fiber from a fabric store. This is sold in “fiber fill” form (bulk for stuffing pillows) and in batt form (sheets for making quilts). Polyester plastic typically is rated to withstand 425 F. In a 350 deg F oven test that deformed test samples of non-fibered Tuff-R polyisocyanurate, polyester fiber showed no sign of degradation. This inexpensive and easily obtainable material has high loft (does not sag), drains water when wetted, does not rot or deteriorate, is easily handled, produces no harmful fiber “dust”, is easily cut with scissors and is simple to install by stapling or stuffing. When saturated under a faucet, a sample compressed about 50%, then ceased to collapse, suggesting that when using bulk fiber to stuff a cavity that it ought to be compressed 50% to forestall formation of voids. We have not tested the insulation R-value to date, so a thickness of 4 inches is suggested to be on the safe side. For a wall-mounted oven, seal the oven and pass-through tunnel against rainwater entry. This is particularly if the cooker is integrated with the structure of the building rather than simply mounted externally in the fashion of an air conditioner. If condensation from food or rain entry is not controlled, the water may leak out the bottom of the cooker and do damage to the building – resulting in peeled plaster, sodden wallboard, dry rot in framing, etc. Rain must be shed or channeled where it can do no harm. If the cooker mounts at the end of an extension tunnel projecting from the house, judiciously placed weep holes may work to provide a drain path for moisture to exit without getting into the structure of the building. The seal should also prevent dust and bug infiltration into the oven and into the house. Whether wall mounted or freestanding, the entire inside should be sealed to isolate the cooking space from the insulation and structure of the oven. This holds moisture emanating from food within the cooking chamber. Excess moisture can exit the oven via the vent holes in the door. Sealing the oven chamber forms a barrier to keep insulation dry. Furthermore this keeps material shed or emitted by the insulation from getting into the food. This is a general concern for many types of insulation. Thermax foam board, for example, may shed glass fibers - and it has been observed when heated to emit a dark film of unknown composition that deposited on adjacent reflective metal surfaces. We make it a practice to seal all our oven interiors, regardless of insulation or construction materials. 100 % silicone caulking is an excellent material as a high temperature, non-toxic, durable, UV impervious, readily available and inexpensive all purpose sealant and construction adhesive. It is tough, abrasion resistant, and flexible. Silicone stretches with thermal expansion without cracking or pulling loose. We use it to solve all sorts of construction difficulties in building solar ovens, such as sealing foam surfaces, coating surfaces, forming gaskets in place, filling voids and gluing parts together. However, as with life in general, “for every solution, there is a problem”. The stuff is very messy to work with. It is difficult to apply neatly. It gets all over the place and all over you and your clothes. Your fingers transfer films of it onto surfaces where you don’t want it. There, it acts a very good release agent, preventing later adhesion of paint, glue or tape. Masking tape helps keep it off where it does not belong. The writer finds that to achieve smooth surfaces, running a finger liberally lubricated with saliva over the wet caulking gives good results (with practice). Spit works better than plain water for some reason. It is alleged that a weak dish washing soap solution will work too. Keep a lot of rags or a roll of paper towels handy. You will need them. 100% silicone cannot be painted. For exterior surfaces not subject to high heat, one may prefer to use a water based latex caulk or a silicone/latex mix to seal joints. Be aware that neither pure latex not the silicone/latex mixes will stick to 100% silicone, so making the use of latex types adjacent to pure silicone on an adjoining surface can be tricky. The latex is paintable, and much easier to apply. It cleans up with water if smeared where it should not be. The silicone will refuse to be removed from almost anything if it takes a mind to adhere to it. Silicone is slow to harden, especially in dry weather. This can greatly delay construction if you must wait for it to cure before going on to the next step. It hardens about 1/4 inch in depth daily at moderate humidity to a “green cure”, and it takes another week to reach full strength. It takes forever in the summer in the arid southwest. At our Arizona site in very dry, very hot weather, glazing attached with silicone was sliding off the cooker several days later due to lack of moisture in the air to react with the raw silicone. Putting wet pads on the skinned over surfaces helps, as does putting damp rags inside the oven. If one reads the labels down at the hardware store, one discovers that not all silicone sealant is rated by the FDA as being food safe. We often use whatever 100% silicone sealant we can find in the local hardware store on the reasonable assumption that the food is not likely to come in contact with it anyway. We prefer to use Dow Corning 999A, which is labeled as food safe and which adheres well to all materials used in solar oven construction - metal, paint, glass, plastic and wood. Other types may be suitable as well. 999-A, while tough, is still rather soft when cured; other formulations may be harder and therefore more desirable where exposed to contact or abrasion. 999A is not readily available – one must go to an industrial supply house. It comes in several colors. The clear is useful for attaching glazing or other areas where the caulk should not show. The black is also good to have on hand to darken areas inside the oven to help absorb sunlight, such as the cut edge of foam insulation showing through the glazing. We also keep some white handy, as the need for it arises from time to time, such as gap filling between two white surfaces. To make silicone stick truly reliably, we sometimes use a nasty primer, Dow Corning 1200, which can cause serious health problems in liquid or vapor form. This stuff is even harder to get because it is a hazardous material that cannot be shipped via UPS or USPS. We usually dispense with the 1200 primer and take our chances that most of the time the silicone sticks well enough without it on a solvent cleaned and perhaps roughened surface. According to Dow Corning literature, xylol, toluol, and methyl ethyl ketone solvents (all highly toxic) (but not soap and water) provide adequate surface preparation, but we have not tried this. Verbally the Dow Corning tech hotline folk inform us that acetone or isopropyl alcohol works nearly as well. Also they say that the liquid 1200 primer is toxic because of the solvents used in it. However the chalky residue left on the dried primed surface is a perfectly safe silicone carried by the solvents. If you are using silicone to form a gasket, then you have the opposite problem: how to make it not stick to the sheet of material separating the surfaces during the curing process. For this purpose one uses 10% petroleum jelly dissolved in 90% mineral spirits as a release agent to coat the separator. Just paint it on and allow the solvent to evaporate. Raise the floor plate a little so it does not directly contact the bottom of the oven box. Several ¼ x ¼ inch wood strips cut from square dowels will do the trick. This significantly reduces heat loss from the primary energy absorber via the oven bottom (the floor plate is the hottest part of the oven, except for blackened pot lids). Painting the underside of this sheet with white BBQ paint to lessen losses has been tried, but it is likely that this did no good since it is reputed that the heat emissivity (infra red) of a white surface is the same as black. It may help to have the underside of this plate left as bare silver colored metal to lessen radiation loss downward toward the insulation, but there are those who claim this is ineffective. We will be experimenting with some high tech insulating paint that promises to be effective, according to expert information, to see if it indeed will help in this location. Contact us for the results. The upper surface of the floor must be black (or other very dark color) to absorb sunlight and convert it into heat. We suggest the use of a 0.062 (62-mil) black aluminum floor (best if “hard” anodized for durability and easy clean up). The heavy aluminum readily conducts heat to cooking pots. The SOS Sport cooker uses much less expensive 19-mil polyester coated aluminum trim coil for the floor, which works well, but eventually will eventually need repainting. Cooked-on food spills tend to remove the polyester finish. It has not been determined how much better the thicker aluminum works than the thinner stock in transferring heat from the floor to the cookware. We intend to settle the issue in side-by-side tests this summer, comparing 12-mil to 19-mil to 62-mil flooring. One can blacken oven surfaces and cookware with BBQ black paint. Black tempura paint, such as produced by mixing the dry powder with white glue, is used by some solar cooking practitioners, but others point out that the paint develops a chalky white surface over time, lessening effectiveness in absorbing sunlight to produce heat. Oven walls should be either dull black or highly reflective. Other dark colors will work nearly as well. Both dark and shiny surfaces have been found to be equally effective, but black paint is a lot cheaper than polished sheet metal. Black and shiny panels can be mixed in the same cooker. White or light colored walls do not work well; they scatter light back out through the glazing, wasting heat. The glazing must be double pane. Single pane does not work for a reflectorless cooker except in very strong and direct sunlight, and then only if the cooker is free to be aimed at the sun. It is inappropriate for a reflectorless design intended for fixed installation in a wall. Triple pane provides no advantage over double pane. Retail plastic sheets will not work satisfactorily as glazing. They will warp, craze, cloud up and disintegrate. Specialty heat and UV resistant plastic is not readily available. Ditto for solar rated plastic film, which is virtually impossible to find. Plastic film is not dog, goat or bird proof. For commercially purchased glazing, we use 5/8 inch overall, 3/8 inch spacing, dual pane, 1/8 inch thick, tempered, clear glass insulated windows with a black or dark bronze spacer bar separating the two sheets of glass. We specify butyl sealant for heat resistance. This substance does not out-gas toxic vapor. Such glazing works very well. It is also costly and heavy. For a 24 by 32 inch window, we have paid as little as $50 and been quoted as much as $150, so it pays to shop around. We hear conflicting reports on the use of specialty glass that admits visible light but blocks the infrared heat radiation from escaping the oven, with some workers claiming it works better and others saying it provides no improvement over ordinary clear glass. Double pane windows often incorporate a fine diameter metal tube (it looks like a wire) that extends from a corner of the assembly. The purpose is to allow air to enter or exit the space between the panes to equalize inside to outside pressure, depending on the altitude of installation. The standard practice of glaziers when installing a window in a building is to pinch off this tube to prevent moisture from entering the space and condensing. Barbara Kerr has solved condensation problems that were occurring in solar cookers by pinching off this tube, which she had previously been leaving open. However the writer does not do this, but rather leaves the tube open, on the theory that the heating and cooling of the oven creates pressure changes that ought to be relieved. He does take care to orient the glazing so that the tube is on the lower (sunward) edge of the cooker so that if moisture does condense, it can run to the lower end of the glazing space and weep out the tube. recommends using double strength rather than single strength window glass. Presumably because it is thicker, it will hold up better than single strength. His designs, being of the funnel reflector, 4-panel concentrator type, subject the glazing to quite considerable heat stress. But then again the glazing size is small, reducing the tendency to crack. Barbara Kerr counsels the opposite, stating that in her experience double strength glass, being thicker, had a higher temperature differential from inside to out, and therefore had a higher tendency to crack from heat than single pane glass. She says that ¼ inch plate glass, except in quite small panes, is almost certain to crack. Perhaps a double strength outer pane and a single strength inner pane would be the best compromise. Cracks in glass usually do not open to cause a gap for loss of hot air from the oven, so there is no urgency to make repairs in them, as they have little effect on oven temperature. If desired, a crack may be sealed with a thin bead of silicone. Even ordinary clear 3-M “Magic Tape” has proved to be quite durable for mending glazing. The glazing must be sealed to circumvent condensation between the layers. Moisture from cooking food will tend to fog up this space and block a significant amount of sunlight. This usually will not be a problem with commercially obtainable insulated glass windows, which are sealed. If it becomes a problem with home made dual layer glazing, or even with a commercial window, provide a couple of 1/16-inch diameter vent holes to the outside air through the spacer between the panes. The first should be in an upper (north) corner. The other should be in the opposite lower (south) corner. Tempered glass is very strong in some respects. It is quite likely to survive a hard blow from a baseball bat. However, be very careful not to nick tempered glass. If you do, you will end up with an expensive pile of glass pebbles. One touch with a metal screw, and the whole pane will magically crumble before your eyes. Take pains to carefully pad the glass during handling and storage, paying particular attention to the edges. If the glass is placed with its weight on a grain of sand on a hard surface, the effect will have you on the phone ordering replacement glass. Glazing of any type should be installed so that it can be replaced without undue effort and without damage to the cooker. Making it removable and also maintaining a moisture seal to protect the insulation space between the walls from both the weather and oven cooking vapor may require ingenuity. One solution is to seal the glazing to the rim of the oven with a bead of silicone inside and out such that a knife blade can be slipped in to cut the glazing free if need arises. Use clear silicone for the inside bead. Sealing inside around the rim is difficult to do without smearing silicone on the glazing, particularly after the oven is installed in a wall. This silicone can be very hard to remove. Another way to seal the glazing to the rim that is much easier to install and remove is to apply a release coat, as described at the end of Section 7, to the perimeter of the glazing. Then lower the glazing onto a bed of black silicone that thoroughly covers the rim. The silicone fills in irregularities in the rim height. The black color hides the rough edge of the rim, and also contributes to the efficiency of the oven by absorbing sunlight at the periphery of the glazing. This heats the rim and reduces glazing edge heat loss. Curing may take several days before the silicone is strong enough to keep the glazing in place. The whole oven may be tipped so the glazing lies level during the curing process so the glazing does not slide off. It would be a good idea not to attempt to lift off the glazing for several weeks, as a full cure to the depth of the silicone will be very slow. 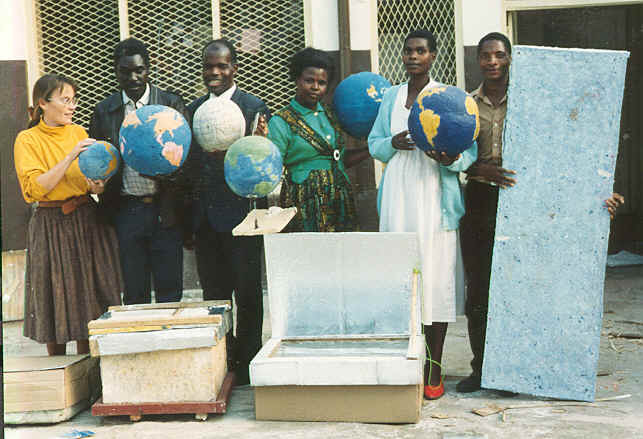 Size counts: make the cooker big enough to cook a full meal for a family on a good solar day. A big solar oven also will successfully cook smaller amounts under less than ideal sun conditions. Furthermore, big pots, skillets, cookie sheets and the like will fit in with room to spare for other cookware. We suggest it be made big enough to contain two 13 x 19 inch “large” cookie trays. A 20 x 30 inch interior floor space works well; it will require glazing about 24 x 32 inches overall. This much floor space will accommodate 6 “standard” 3-liter cooking pots (although cooking would be slow, even in strong sunlight, if this many pots were heavily loaded and all put in at the same time). Most of the cookers we have made over the years actually have been an inch or so larger than this. A freestanding cooker this size will require carrying handles to move it around, particularly if glazed with glass and/or made of plywood, as it will be quite heavy. Some folks put their cooker on a garden cart to move it around (to follow a sunny patch in the yard, for example), and to aim it at the sun. The angle is not critical. Anything between 20 and 30 degrees is acceptable, but generally cookers have been built with angles between 20 and 25 degrees. Glazing in the 25 to 30 degree range might be a better idea further north, say 45 degrees north latitude. The 14-inch height allows the upright placement of gallon-sized jugs across the back of the cooker for water pasteurization. A door of the recommended height allows tipping a freestanding oven so that it rests on the rear door to cook in low angle sunlight. This presents a steeply slanted glazing surface to intercept most of the available light. For this position, the cooker is loaded by placing pots on the opened door, then raising (rotating) the entire cooker up with the door laying flat. The 11.5 inch height will clear two “standard” 3 liter pots (shown as "Three-pound roaster" at: http://65.108.108.197/catalog/supplies-c-2.html?osCsid=5cee5dfca0fbb80b13a6ab53dbc58f4b) stacked one atop the other with the bottom of the upper one acting as the lid of the lower one. The suggested door width will accommodate two such stacks, allowing a total of four pots in the oven in this position. You may choose to increase the floor size some. The heights are well proven in practice, and you change them at your peril. Too low and your pots may not fit. Too high and the effectiveness of heat transfer into the food may suffer. The floor of the pass-through tunnel should be set such that the oven floor is at elbow height. Assuming the door opens downward onto the pass-through floor, the upper surface of the door then will also be at the oven floor height, or close to it. This is about 42 inches for a person 5 feet 6 inches in height. The tunnel opening itself ought to be something like 18 inches in height to allow adequate access and visibility into the oven. The tunnel walls ought to be insulated to prevent heat loss from the home in winter or heat infiltration into the home in summer. On a southerly facing wall oriented somewhat to east or west, always slant the cooker relative to the wall so that it faces due south. For a house not oriented on a true north-south / east-west axis, location of the cooker on the most southerly facing wall as close as practical to the southernmost corner will give good results. In this position, the cooker will tend not to suffer shading in the afternoon either from the roof overhang or from the house walls. For a cooker mounted in a true south-facing wall, installing it close to the east or west corner will extend cooking time, particularly in summer when the sun rises and sets considerably north of the due east-west axis. For example if mounted at the west corner, it will catch late day sun for a longer time, particularly if fitted with a reflector which can be brought in to play to scoop in the low angle light until the sun hits the horizon. As in the case for all fixed mount cookers, this optional reflector would have to be hinged or removable to keep it from getting in the way during portions of the day. Assuming the cooker is installed in vertical rectilinear wall oriented due south, the following formula applies to determine how far the top corner (northernmost edge) of the glazing must be positioned beyond the exterior wall of the house, given the latitude, the depth of roof overhang and the distance of the top corner of the glazing below the roof overhang. P = projection of pass-through (distance from house exterior wall surface to edge of glazing). This equation is presented below as such calculations appear on tax forms. 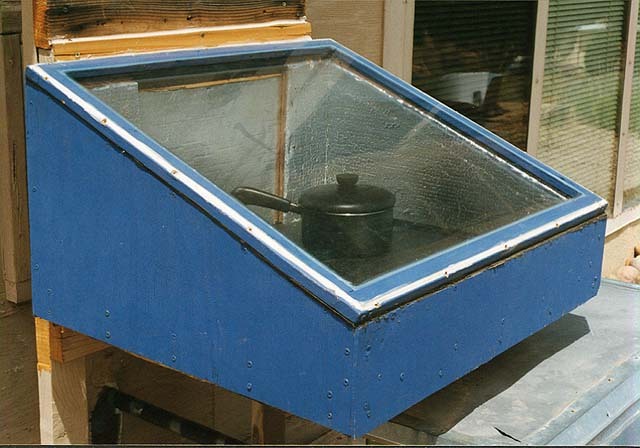 The slant-faced box cooker, of which the Solar Wall Oven is an example, is intended to work well without reflectors. Despite that, one is tempted to add reflectors to “soup up” the performance beyond the original design objectives. Primarily, reflectors added to either freestanding or wall mounted cookers will allow cooking in less than ideal sun conditions: partial cloudiness or low sun angle (high latitudes, winter, early or late in day). They also yield faster cooking and pasteurization under any sun conditions, allowing an oven to cook significantly more food or purify much more water in a day. An important consideration here is that cooking with reflectors extends the number of hours for cooking from earlier in the morning to later in the afternoon. This allows use of the sun before the clouds come in or food to be kept hot for a later dinner. It also allows more effective use of low angle sunlight during winter months to increase cooking power. The desirability of enhancing heat collection using reflectors increases with cold weather, high altitude, high latitudes, short winter days, wind and heavy loads of food – all factors that impede the cooking process. The penalty for using reflectors is greater complexity of construction, unsightly appearance, vulnerability to wind (breaking the reflector panels or overturning a freestanding cooker), the need for frequent re-aiming, the need to manage the reflector angles, personal and neighborhood glare nuisance, the danger of overcooking or burning food, and concern for damaging the oven due to overheating. For a through-the-wall installation, reflectors generally will require the cook to go outside to adjust the reflectors occasionally, negating some of the convenience having a built-in solar cooker. Overheating is of particular concern if you elect to use Thermax polyisocyanurate foam panels for insulation – you are pushing this material to it’s limit when the oven reaches 300 deg F, which can happen without reflectors with an empty oven in full sun. Reflectors can raise the oven temperature to 350 deg F, making one worry about damaging the insulation, or otherwise shortening the life of the cooker. Reflectors may also damage plastic glazing due to overheating. One way to approach the reflector issue is to construct the oven without reflector(s), then add them later if the cooking situation seems to warrant it. For high efficiency, slant-faced, box cookers such as the Solar Wall Oven or the Sport, the writer views reflectors as an option for occasional use when needed, but to be taken off the cooker under good sun conditions. He may, for example, get the food up to cooking temperature in the early part of the day, then remove the reflectors to prevent overheating problems for the balance of the day. Barbara Kerr, on the other hand, considers putting reflectors on a Solar Wall Oven to be too much of a nuisance to be bothered with, whether freestanding of wall mounted. The type of reflector to use depends on whether or not the oven can be turned to aim at the sun and whether or not the oven is intended for use also as a retained heat “haybox” type cooker. We need to consider through-the-wall mounted and freestanding cookers separately. For through-wall-installations in temperate latitudes, the Kerr-Cole Center has come up with an effective design we have dubbed the “3-panel adjustable reflector”. See Figure 1. The reflecting panels are hinged for repositioning to collect sunlight to good advantage all day long. Compared to a freestanding cooker, a cooker installed in a wall with a 3-panel adjustable reflector has the advantage of not needing turning to face the sun. Only a panel angle adjustment three times daily is required. It also has the advantage of having available the solid structure of the building to brace the panels against the wind. This overcomes a couple of the drawbacks of reflectors, the need for frequent re-aiming and the vulnerability to wind. The inward slant of the panels also means that nuisance glare is eliminated. The reflector can be mounted to the house and cooker supports rather than the cooker itself, simplifying oven construction and installation considerations. An adjustable 3-panel reflector does not need much attention. An initial setting in the morning followed by a mid day positioning followed by an afternoon positioning will allow good heat collection all day long. A clever person might even devise a way to adjust the panels from indoors, eliminating the need to go outdoors. 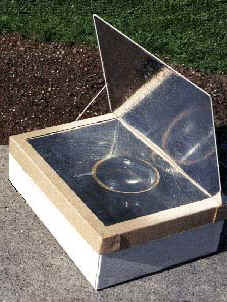 Figure 1: Solar Wall Oven with Experimental 3-Panel Reflector. A south facing installation is depicted in late day configuration to collect low angle sunlight from the southwest in winter. West panel extended fully. East panel brought in fully. The front strut is a fixed length, tensioned rod to rigidly brace the fixed rear reflector perpendicular to glazing. The adjustable length tensioned rod for holding the west panel in position is also shown. A third strut (not shown) is used to hold the east panel when it is not fully brought in. In mid day the east and west panels are partially brought in. In morning the east panel would be fully extended and the west panel would be fully brought in. This design was successfully used to collect sunlight with the sun close to the horizon at 35 degrees latitude on a cooker with 20 degree slanted glazing. The dimensions and angles, as shown in Figure 2, were a "cut and shoot" quickie design. They were not mathematically determined and no claim is made regarding optimal performance for the given latitude and glazing angle. The struts for the reflector panels may attach to the oven as shown, or may attach to the house or oven mounting structure. As shown, the rods ought to be tensioned - that is a cord or an elastic band should strongly pull the panel toward the oven attachment point of the rod. The cord should not fasten to the rod itself. A similar arrangement would work if the rods attached to the house. One half inch diameter wood dowels serve well as struts. 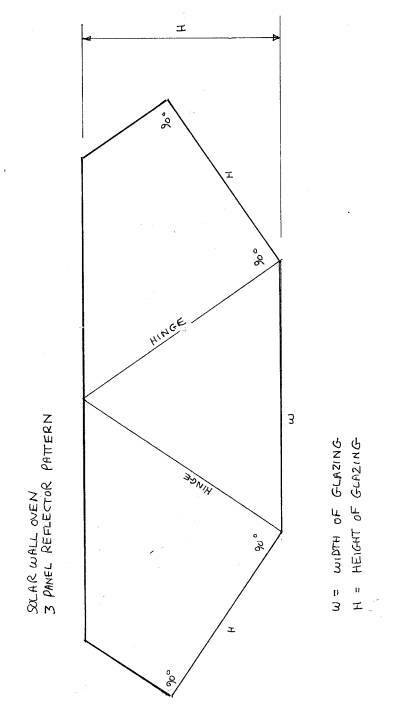 Figure 2: 3-Panel Reflector for Fixed Installation of Solar Wall Oven. At our 35 degree latitude, we have found that this 3-panel adjustable reflector works very well in the fall, winter and spring seasons for a due-south, fixed aim cooker in terms of power collection, length of cooking time and simplicity of use. It is not effective in the summer, but neither is it needed in the months of long days, hot weather and high angle sun. 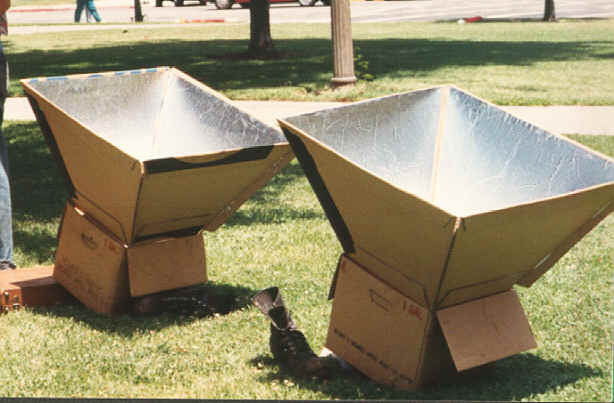 The cooking capacity of the basic Solar Wall Oven (i.e., without reflectors) reaches a maximum in the weeks before and after the summer solstice (June 22). The reflector gives a boost when it is needed, in the cold, short, low sun angle, winter months. From the fall equinox (Sept 22) through winter to the spring equinox (March 22) effective heat collection would be from sunrise to sunset. At the equinoxes the reflectors will be effective 12 hours from 6 AM to 6PM, yielding the longest cooking times of the year. After the spring equinox the time duration of effective heat collection of the reflectors progressively diminishes. The reflectors will remain effective until perhaps 6 weeks after the spring equinox (until May 10). This loss of effectivity of the reflectors occurs because the sun rises and sets north of the east-west axis during the summer half of the year, with the result that the house blocks light early and late in the day. In the fall, the reflector will become effective again about 6 weeks before the fall equinox (until Aug 10). The duration of effective heat collection added bys the reflectors progressively increases as the fall equinox approaches. In the intervening 3 summer months between May 10 and Aug 10 the reflector does not help for three reasons. First, until about 8 AM the house will block the sun. Second, by the time it reaches due east at about 8 AM and can illuminate the cooker; the sun will be so high in the sky that the reflector can collect little additional light. Third, toward noon the reflector will generally be in the way and actually shade the glazing. As the sun travels toward the west in the afternoon the reflector will be ineffective in the same way it was in the morning. Conclusion: In the interval between May 10 and Aug 10, the reflector should be either removed or folded back out of the way. For an in-wall installation in the tropics (possible in a domed or vaulted structure only) (see discussion in Section 3), the reflector design must be different – the adjustable 3-panel configuration will not work. A single panel will work, slanted inward to catch low angle light for horizontal or near horizontal glazing. It should be removable so that it can be placed on the either the east or west lip of the cooker to collect light early and late in the day. Mid day the sun will be high overhead, and the reflector will not be needed to redirect low angle sunlight; it should be entirely removed until evening to keep it from shading the glazing. Observe that near the equator a cooker with an eastward facing reflector will cook breakfast. This is an important consideration for architects and designers of equatorial dome shaped homes. Instead of a single reflector that the cook moves from the east or west lip of the cooker, one may hinge reflectors to the east and west lips of a flat glazed tropical cooker. By adjusting the angles of the panels to morning, mid day and evening positions, this two-reflector design can be effective all during the day in a fashion similar to the 3-panel reflector for temperate latitudes. This type of design has the advantage of collecting extra light in less than full sun weather such as on a pertly cloudy day. For a freestanding cooker, there are two common choices for reflectors, the classic 1-panel rear mounted reflector and the 4-panel “funnel” type. These types each have their advantages and disadvantages for a freestanding cooker. Neither will work for a fixed mount installation, as they both require the cooker to turn to face the sun. In the absence of sun, a 200-watt auxiliary heater (such as an incandescent light bulb installed in the oven cavity) will keep food hot enough to prevent incubation of food spoilage microorganisms before dinner is served. If one places insulation (an old quilt for example) over the glazing, only 100 watts is required. Use a thermometer to verify that the oven remains 150 deg F or above. Foods held more than 2 or 3 hours in the incubation temperature range between 50 deg F and 150 deg F may suffer serious spoilage. Toxins from bacteria such as botulism (which is not totally destroyed below 240 deg F) can cause fatal food poisoning. Foods in the danger zone of temperature must either be cooled below 50 deg F or reheated above 150 deg F to inactivate microorganisms. Food that has slowly cooled from cooking temperatures down through the danger zone over a period of 2 or 3 hours to below 50 deg F should not be re-warmed later to again reside in the danger zone, but rather should either be eaten cold or brought to cooking temperature above 180 deg F. The point is that the total time the food remains at incubation temperature over more than one episode of cooling and warming should not exceed 2 or 3 hours before the food is brought to cooking temperature to sanitize it. With 200 watts and the glazing covered with insulation one may continue or even initiate the cooking process. The writer slowly cooks food this way on occasion, using the Solar Wall Oven as a sort of giant crock-pot. This is a good way to cook the beans overnight for the next day’s chili if sufficient electrical power is available to keep the heater on at night. The heater should be thermostatted to prevent overheating. One must protect against inadvertently leaving the heater on with the oven in full sunlight, particularly if the reflectors have not been removed. This article analyses where the solar energy that enters a cooker goes in the time it takes to get the food to cooking temperature: how much heats the food, how much heats the oven box, how much escapes through the sides and bottom and how much escapes back out the glazing. Highly reflective polished metal surfaced plastic film may be obtained from Nielsen Enterprises: http://www.mirrorsheeting.com/. This material is suitable for external reflectors. Our experience with using plastic reflecting film inside the cooker is that it gets very brittle and fragile after a year or so. For both oven interiors and cookware we use a 1200 deg F BBQ black paint such as Rust-Oleum High Heat enamel, UPC 0 20066 77788 3, also designated as (BAR-B-Q-BLACK 7778). When used on cookware, it will adhere better (last longer before requiring repainting) if the surface is roughed up. We scour glass vessels with sand. One might wire brush a metal pot. Do not allow paint to lap into the interior of the pot.